I took a holiday. Two weeks in Italy. We walked 10+ kms every day. We ate terrific fresh, local food and drank a lot of wine. I shopped. Leather bags, gold jewelry, glass from Merano and hand woven scarves from a craft market in Pisa. I stood amongst sculptures by Rodin and paintings by Andy Warhol and all things Michaelangelo. We smelled perfume from bottles created in the 16th century. My aunt sang bird songs for the birds in Michaelangelos gardens and they sang back copying her tone and key. My feet got sore. I drank perfect cappuccinos with sugary beignets and croissants filled with apricot jam. We took trains. We carried luggage up and down what seemed like endless stairs. We ate artichokes for almost every dinner. I stood in wonder at the Leaning Tower of Pisa and felt what 1000 years of human habitation can look like, absolutely beautiful. I was always lost in Venice. There is something about being lost in an ancient maze of stone and slow moving canals that is nourishing for my soul. I didn’t need to be anywhere in particular so why not be lost where people have lived and flourished for more than a thousand years. At 6 am I wandered the streets in the silence and sat by the sea watching the city come alive. Boats of every shape and size motored by carrying everything that a modern city needs. Everywhere men were sweeping the streets of the endless cigarette butts and garbage left by the people who visit Venice. The fish market comes alive early and tables are piled high with all things edible. For dinner we ate sea bass, shrimp risotto, and sardines on cream of wheat. On the chicchetti walking tour we drank prosecco and nibbled on grilled squid. Cod was carefully mixed together with olive oil and salt and pepper then put on pieces of crusty bread. Delicious. Then there was polenta. Topped with tomatoes, or braised beaf or chunks of cod and saffron sauce. Lost in Venice we wandered from cafe, to restaurant, to museum, to shops of every kind. When our feet and legs had more than enough we wandered back in the direction of our room looking for landmarks that lit the way. My sister Jane and I went to the opera in Venice. After a long day of walking we dressed up and put on shoes that hurt. We gave ourselves enough time to be lost and eventually found the opera hall, walked up two flights of stairs and were shown to our box. We sat gratefully on our chairs leaning out to take everything in. For two hours we sat serenaded by Verdi’s music, absorbing the atmosphere of childhood dreams come to reality. Every once in awhile Jane and I would look at each other and remember that we grew up in this backwoods town on Vancouver Island and here we were sitting in the Venice Opera house a place that had only lived for us in the pages of National Geographic Magazine and the novels of Donna Leon. After some confusion at the train station in Venice we finally discovered our train and found our way to Firenze. Away from the sea towards the ancient seat of power of the Medicis. What a different place. 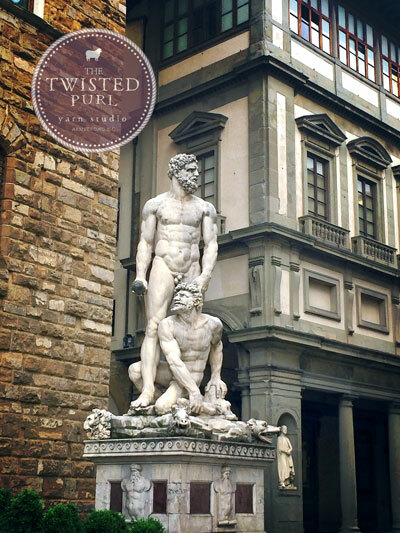 Built around and upon the Arno River, Firenze overwhelms and entices. Galileo, DaVinci, Michelangelo, and their friends explored their passions here leaving behind a body of work that continues to impact the world. I walked in the sunrise along the Arno loving the Tuscany colours and sculptures, medieval walls and cappuccinos with panninis. Shopping in Firenze is simply an amazing feast for the retail mind and heart. Jane succumbed to a beautiful leather jacket and I found gold on Ponte Vecchio. The city of Siena was our last city. So completely medieval and intact. There is an intimacy of living there that is very appealing. Built over many centuries the centre Palazzo is built for people of all stripes and we sat in our first evening with the moon as people picnicked and connected and the light shone upon ancient stones. I ate toasted pine nut gelato, double. I holidayed from knitting on this trip. I carried my bag of knitting the whole time but it would seem that I needed a break. So I am back in my Okanagan world, planting seeds and plants and enjoying this wild that we live in. A holiday that inspired and nourished body, mind and soul.